Roofing done right since our first shingle in 1958. When we first opened our doors back in 1958 our purpose was simple; we wanted to bring together professional roofing contractors, manufacturers and suppliers who are dedicated to the promotion and protection of the public interest in everything that relates to roofing. Our mission is to give our members the training, technical support and leadership to enable them to offer their customers the highest quality roofing practices, guarantees and business ethics in the roofing and related industries in BC. RCABC established the first roofing guarantee that’s backed by both the contractor who does the work and the RCABC itself. It’s called the RoofStar Guarantee and is based on having qualified contractors, well-trained installers, accepted standards for materials, and independent inspections. That means only roofs built by RCABC members can be covered by the RoofStar Guarantee. We don’t just stop there, we also take a proactive role in advancing roofing technology and built the RCABC training centre, the first educational facility in North America designed for and dedicated to training the entire roofing industry. In 1960 RCABC established the first roofing industry warranty that is backed by both the contractor and RCABC. The RoofStar Guarantee Program is based on accepted standards for materials and guidelines that require inspections of roofing applications by independent, accepted roofing inspection firms. RCABC is proud to have been the initiator of the first roofing association-backed guarantee in Canada, covering both workmanship and materials. 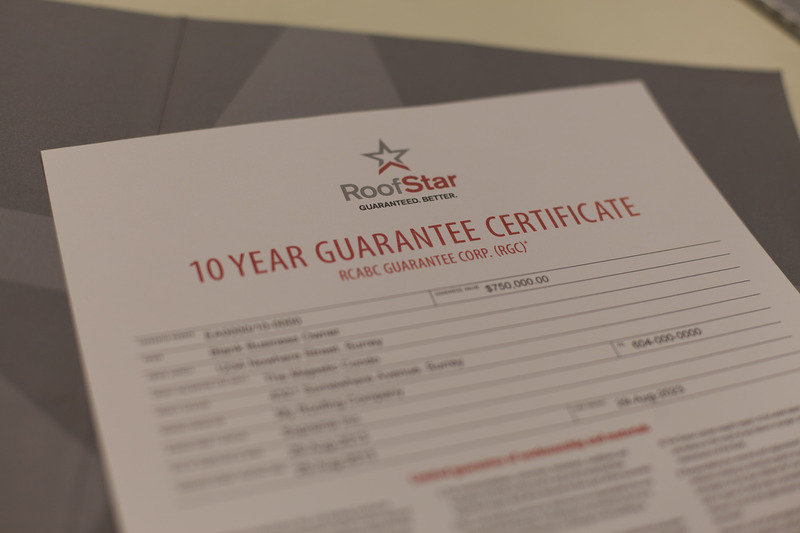 Only roofs installed by RCABC members can be protected by the RoofStar guarantee. RCABC is affiliated with the Canadian Roofing Contractors Association as well as the National Roofing Contractors Association in the United States. RCABC is a roofing industry advocacy group working on behalf of our members, the industry, and the general public. RCABC participates on a variety of advisory committees focused on the construction industry, construction industry standards and government advisory agencies.